Sadly, widespread homelessness isn’t going away any time soon, and until society works out a larger solution, ideas are needed to improve the living conditions of people without a home right now. 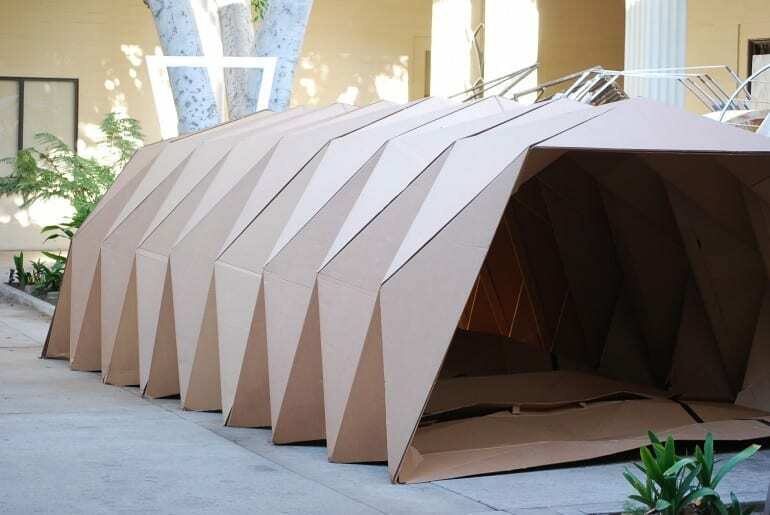 One such idea put forward is a cardboard-constructed pop-up shelter dubbed “Cardborigami,” which is designed to serve as a transitional shelter until a permanent home is found. Cardborigami is the brainchild of Los Angeles-based designer Tina Hovsepian, and is said to draw inspiration from the Japanese paper-folding art of origami. The unit is actually produced in two iterations, with a sizable version 1.0 aimed toward humanitarian crises, while the more portable 2.0 is conceived for single-person use by the homeless. The latter model appears to be the main focus of the designer. Cardborigami 2.0 weighs 10.5 pounds (almost 5 kg), and is finished with fire-retardant and water-resistant coatings. It folds easily, and can be erected in under a minute by one person – no assembly required.